Joe Blasco personally designed and applied scores of various make-ups in easy-to-understand, step-by-step processes. Also included is the work of many past, and today’s most highly respected professional make-up artists from Hollywood and around the world. 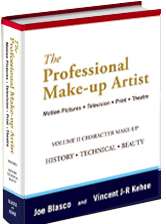 This most comprehensive book, “The Professional Make-up Artist“, fills in the gaps left by all other makeup books to date. Every technique is explained in full color and painstaking detail. 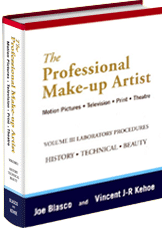 Joe Blasco and Vincent J-R Kehoe have written what professional make-up artists worldwide have claimed to be the most important and historic book ever written for the field of professional make-up artistry. Volume I, II, and III features detailed information concerning make-up history, state-of-the-art technical information, historical film and video data, and the most complete education in classic beauty, high fashion, and fantasy make-up. In addition to make-up for men and a multitude of other make-up techniques too numerous to list, there is also over 1,000 full-color pages. The world of professional make-up artistry is unveiled and placed within reach so that now you can learn and understand the techniques which have made Joe Blasco and Vincent J-R Kehoe two of the most highly respected make-up educators of our time.